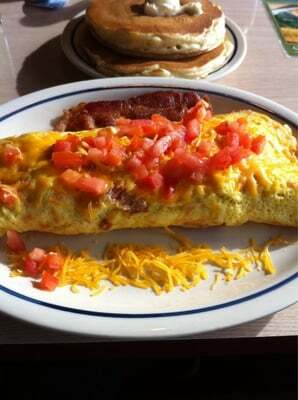 Bacon Temptation Omelette: Loaded with six strips of crispy bacon, a rich cheese sauce the topped with Jack and Cheddar cheeses and diced tomatoes. IHOP omelettes use 3 egg which are beaten and mixed with the appropriate chunky ingredients, and the whole thing is poured out thin on a giant griddle. When the eggs have firmed up, two sides are folded over, the filling is positioned, and the omelette is rolled over once, twice, three times so it ends up looking like a burrito, sort of. The bacon should be cooked before you start your omelet. The cheese sauce is made by adding Velvetta into the omelet as it cooks.